Editor’s note: With a global fan base that includes former U.S. President Barack Obama, Facebook founder Mark Zuckerberg, and “A Game of Thrones” author George R. R. Martin, Liu Cixin is a celebrated author of hard science fiction (a type of science fiction based on scientific accuracy). “The Three-Body Problem,” book one of a trilogy, was the first translated science fiction novel to win the esteemed Hugo Award for best novel, in 2015. 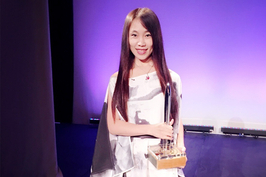 In November, Liu received the 2018 Arthur C. Clarke Award for Imagination in Service to Society, in Washington, D.C. In October, he toured cities in Germany and visited the Frankfurt Book Fair to promote his latest novel translated into English, “Ball Lightning,” and the upcoming release of the German translation of a collection of short stories. 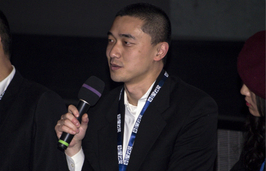 Wang Jing, an adviser of Chinese and Western cultural projects and a senior project coordinator and adviser at the Confucius Institute Headquarters, accompanied Liu as a translator and wrote about her time with the author for Caixin Weekly in an article titled “Liu Cixin’s Tour to Germany in 2018: Sitting in God’s Home and Talking about Science Fiction.” Below is an abridged translation. For the middle of October, Frankfurt was unusually warm, over 26 degrees Celsius (79 degrees Fahrenheit). 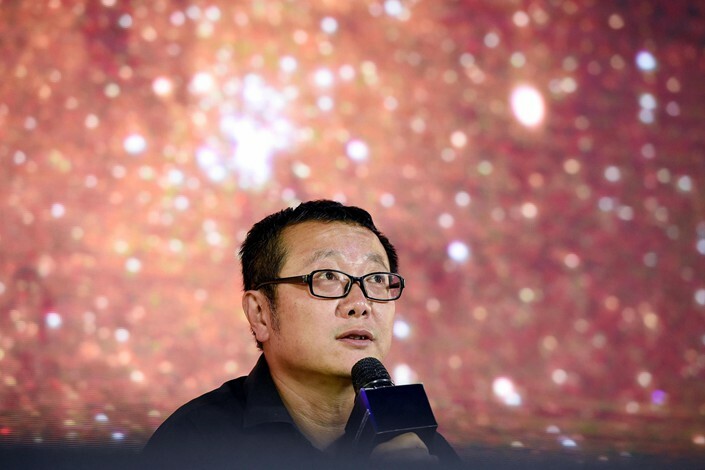 When we picked him up at his hotel, Liu Cixin was wearing a black shirt and dark bluejeans. He stared out the window, observing the city from the car. After arriving at the fair, Liu faced flashing cameras and chatted with German publishers. He was visibly uncomfortable to the point that the public relations manager couldn’t help but suggest he relax. But I suppose that was his strategy for managing the situation. He always focuses his attention on responding to questions, rather than engaging too much with the audience’s intense enthusiasm. I think his modesty and reserved nature maintains the distance he intends to keep from the world. With this distance, he can survive in the science fiction world and wander in the real world simultaneously. Liu looks young for being 55 years old, with only a few gray hairs around his temples. Perhaps it’s just good genetics, though he also runs 10 kilometers (6.2 miles) every day. His black-framed glasses slide down his nose, requiring him to push them back up from time to time. When he goes out into the sunshine, he swaps his glasses for prescription sunglasses, which he keeps in a polka-dot case. He carries with him a dilapidated old bag — which we almost lost in Frankfurt — containing valuables such as his passport, cigarettes, pens and a jar of chilis. He doesn’t need to be taken care of, and he doesn’t want to bother anyone. The audience was amused and eager to hear Liu’s response to the provocation. “If people in the world, especially men, were so self-restrained,” Liu said slowly, “humans would have landed on Mars and flown out of the solar system. We would live in a different world.” The audience broke out into laughter and applause. Liu has been gaining popularity in the West. The New Yorker called him “the Sir Arthur C. Clarke of China” and one of the most respected writers of classic science fiction. He counts Barack Obama and Mark Zuckerberg among his fans. Since 2017, Scheck has been pushing “The Three-Body Problem” on his TV program, saying it is the most exciting and innovative science fiction work he has read in 30 years. He has even said that the trilogy saved science fiction in the 21st century. “The Three-Body Problem” has sold well in European and American markets and it won the Hugo Award, the worldwide awards for science fiction literature, in 2015, becoming the first translated novel to do so. Liu is the only Chinese author to ever appear on the Der Spiegel best-seller list, Germany’s most authoritative ranking. A manager of a large chain bookstore in Germany told me that science fiction readers are a minority in Germany, with readers of hard science fiction numbering even fewer. That “The Three-Body Problem” would do so well indicates that it appeals to readers of all walks of life — including people in IT, investment, aviation, and even the military. 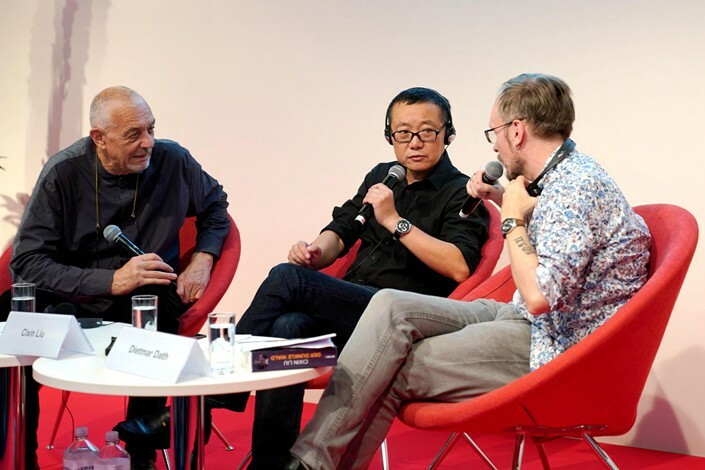 Liu frankly shared his puzzlement at the trilogy’s success with the German public. When he wrote “The Three-Body Problem” more than a decade ago, he was an engineer at a power plant and wrote amateur science fiction. It never would have occurred to him that one day his novel would be read by Chinese readers, let alone foreigners. Nor that he would be “stopped every 2 meters” by fans asking for autographs, as one German journalist described it. Perhaps the people in the city of Yangquan, 400 kilometers from Beijing, don’t bother him. But as we traveled all over Germany, Liu’s phone often received calls from home, messages on WeChat and emails. He basically ignored them. The organizer of his trip refused a few invitations, saying that he had no time. Liu asked him to be more honest and say that he did not want to attend so that they would not try to reschedule. “The best choice for a writer is to hide behind his book,” he told Deutsche Radio. “The air quality where I live is not very good, so I can’t see the stars very often.” Another modest response from the science fiction author. Throughout the trip, Liu carried a global library of science fiction books with him. “You have to read at least a thousand science fiction novels to understand what science fiction is,” he said. Many of the books did not have a Chinese translation, so he read the English version. We began to suspect that he had deliberately concealed his English proficiency, but he stressed that while his reading competency was high, he struggled with listening and speaking, because in Yangquan he had no opportunity to practice. It is difficult to be in Germany and not discuss philosophy. Liu believes that philosophy is more like science fiction than science because science has only one image of the world while philosophy has many. A large number of philosophers put forward different images of the world while looking at the same world, just as science fiction novelists write different images of the universe and the future of mankind. So is the dark vision of the universe described in “Dark Forest,” the second book of “The Three-Body Problem” trilogy, the future that Liu himself believes in? This was a question posed frequently. Is the future of mankind utopia, or more of an anti-utopia? Is it light or dark? Is the contemporary thinker who ponders the future from the perspective of scientific fantasy able to give us an answer? Liu first explained that science fiction is not futurology. “What science fiction novelists do is arrange the different possibilities of the universe and the future. ‘The Three-Body Problem’ is one of the many possibilities, and one of the darkest. I think it’s a responsible way to point out to readers the worst possibilities and remind them to be ready for the future,” he told people. “Moreover,” Liu continued, “we also know that science and technology will bring about various negative consequences and even disasters, such as the last century’s NATO nuclear confrontation, which almost destroyed humanity. I have played a mind game: If all the great processes in human history had taken place — such as the Renaissance, the Enlightenment and the Reformation of Religion — but had not led to the scientific revolution, what would human society look like? Would it be better than it is now? This is a very interesting question. My personal view is that among the various human knowledge systems, the scientific knowledge system is still the most effective. “The greatest danger of science and technology is to stop its development. Chinese intellectuals do not agree with me, but as an engineer-born science fiction writer, this is my reality. In the long run, everything on Earth has an end. The technological revolution is the only method for avoiding this end. It is possible for humanity to be the species that leaves Earth and expands civilization on a larger scale elsewhere in the universe. This may be our ultimate goal, and that ultimate goal depends only on science and technology. Whether we have a bright future depends on our choices about the future. If we make the wrong choices, our future will probably be as dark as the one described in science fiction." Addressing Liu as the creator of “cosmic sociology” in “The Three-Body Problem,” German intellectual and science fiction author Dietmar Dath raised the concept of “morality” in science fiction. He found that Liu’s book maintained a cautious distance from moral judgment. This December, German publisher Heyne will launch a collection of Liu’s short stories, titled “The Wandering Earth,” some of which were written 20 years ago. Liu believes that his success is inseparable from China’s growing technological strength. He is a bit frightened by the idea that technology could kill science fiction — we nearly live in the world described by science fiction. “Do you plan to write until science fiction no longer exists?” asked a reporter from North German Television. The last public event of Liu’s trip to Germany was at the Church of the Holy Cross in Berlin. The event was delayed by half an hour as crowds poured into the church, filling hundreds of seats in the hall. Discussing science fiction in an old church was a miracle in itself, not to mention that the science fiction writer featured was from China. “Do we really need to be thinking about aliens?” asked one audience member. Is Sci-Fi the Next Big Chinese Cultural Export After Kung Fu?